Reading Terminal Market in Philadelphia is a century-old institution in the heart of the city. There has been an Amish presence in the market for nearly three decades. 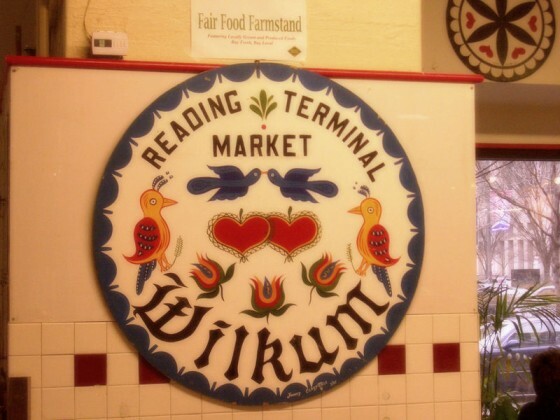 I write about Reading Terminal in my book, as well as in a post last year on Amish markets. In a recent article, Summer Beckley of The Temple News gives a brief but interesting history of the market, which has seen its share of ups and downs. In any case, visiting the market and taking in its diverse mix of merchants is an experience to remember, and a trip worth taking if you find yourself in Philly. Hey thanks Mike, I remember your comments on the market stands post I did last year. And I checked it out, you did an awesome job on that sign!! I absolutely love Reading Terminal Market. I used to live right around the corner on 12th St. and would spend every Saturday morning walking around. Such a rich atmosphere. I found a connection for Amish furniture and I’ve been collecting ever since. It’s a sign of a healthy market and community when Plain people set up shop. Pragmatic as they are, they want to see a return on their time and effort. I did ministry in a farmer’s market for a couple of years; many vendors were hobbyists, a few made their livelihood there. We were the only Plain people, though – the potential sales weren’t enough to attract the Mennonites across the province. Reading Terminal is an amazing eclectic, diverse, & international oasis in Philadelphia. New York Bagel, and Subway are not welcome. Seafood, fresh catch, cleaned, or cooked. Six continents of food stands. Teas, coffees, pastries, books, you name it. The space is a blend of aromas and spices that rivals the best flower arrangements. PA Dutch run; butcher shops, bakeries, snacks, and lunch counters. The lunch counters sold me. Service was quick, welcome, & friendly. Food was fine, price is reasonable. People hover around the area to grab a seat. Try Dutch Eating place. Reading Terminal, a fine destination. I am interested in purcasing an Amish quilt.